If you do not mind waiting while they restock, you can find these excellent speakers on sale for only $149.50, half off the normal $299 retail. The MD-100W JBL PowerUp Wireless Charging Speaker is stylish and functional. Once your device is paired with it, all you have to do is place your NFC enabled and wireless charging capable device (like many Nokia Lumias) on top of the speakers and the music flows while you power up. Only the cyan and black colors are on sale, and the black is running out of stock. Cyan is already out of stock but Amazon is still offering the sale price with a promise to ship. Unfortunately, white is not on sale. 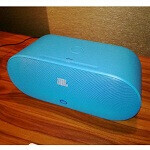 If you have seen these JBL wireless charging speakers in action, they pack great sound in a small package. They are portable and only weigh about 4 pounds. Check out the Amazon listing here. You will need to look at the black offering carefully, as some vendors do not have it on sale. I've only had good experiences with JBL, so I don't think quality and loudness would be issues. I've got JBL speakers on my Dell XPS, and man, that thing blows other laptop speakers out of the water! The sound quality is quite frankly second to none, especially on laptops because it sounds just like a full-blown high-end stereo system. Loudness won't be a problem either. I always blast it loud, and people can't believe how loud they are, especially at school.